The BC Utilities Commission final report on Site C is a bombshell. It now seems very likely we will see the termination of the BC Hydro mega-project by the end of the year. I had anticipated a final report that was more equivocal, which would result in a difficult decision for the BC government. But the key findings essentially reject all of BC Hydro’s arguments in favour of the dam. Interestingly, the economic case for Site C before BCUC was biased in favour of completion due to “sunk costs.” That is, going forward we should not count the $2 billion already spent and just look at how much it would cost to get to completion. By this formulation, it’s Site C power at a discount—although ratepayers would still have to pay for the full amount. The BC Utilities Commission final report on Site C is a bombshell. Even if we accept that argument, it now looks like at least another $8 billion would be needed to complete Site C rather than the $6 billion touted just a few months ago. Second, the whole case for Site C was predicated on large increases in future demand for electricity. Most of this was from new liquefied natural gas (LNG) operations and expanded upstream gas production. But we know that the dismal economics of LNG—the cost of landing that gas in Asia is greater than the price it would receive—have led to most LNG proposals being shelved. In other words, if we build it they may not come. 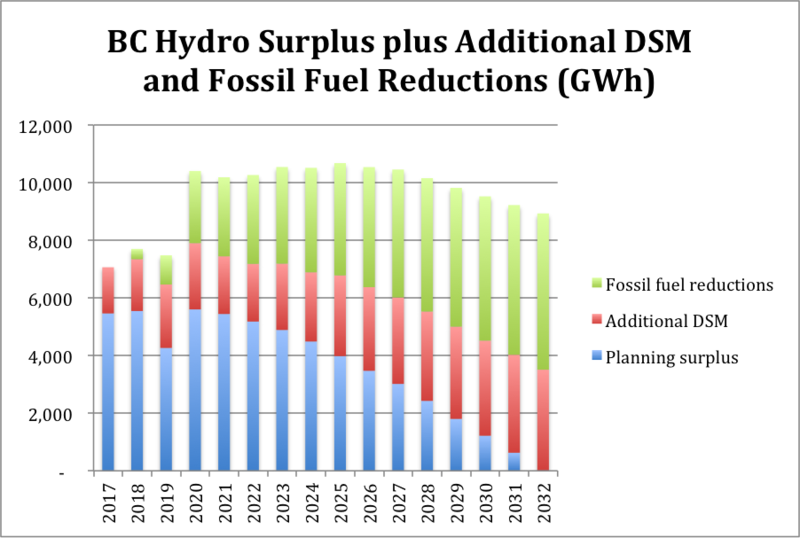 In my submission to the BCUC I re-estimated demand based on more recent information and more realistic assumptions and found a surplus of electricity up to the early 2030s (blue bars in the Figure). I then looked at the potential supply available should BC pursue more aggressive conservation/demand side management (DSM) policies (red bars) and wind down the province’s fossil fuel sectors in line with climate action (green bars). I only had data to 2032, but even then, this exercise leads to a surplus of electricity on the order of two Site C dams. This would be available for new, green industries and electric cars. The BCUC report uncovers several other ways in which BC Hydro inflated demand forecasts to favour Site C: Hydro’s estimates of GDP and disposable income are higher than forecasters; understating the response of customers (called elasticity) to higher electricity rates; and, the bizarre assumption that Hydro rates would not go up at all between 2025 and 2036. BC Hydro also deliberately under-invested in conservation (demand-side management or DSM) programs so that future demand would be higher and thus justify Site C.
Third, even if that demand materializes, Site C is not the only way of meeting it. The BCUC report delivers on a request to compare proceeding with Site C with an alternative portfolio of DSM—wind and geothermal. It now looks like at least another $8 billion would be needed to complete Site C.
The estimated cost of power in the alternative portfolio is $32 per MWh versus $44 for Site C on an apple-to-apples comparison. Essentially BC Hydro has been caught out for making a spurious comparison in its submission, which artificially lowered the estimated cost of Site C while raising it for other renewables. A key difference is that those alternatives can be brought on-line more gradually if and when they are needed. Site C is like putting all of your eggs in one basket with the huge risk that the power you generate cannot be sold for anything close to what was paid for it. It’s also worth remembering that the BCUC inquiry had a narrow scope focused on core economic issues. Out of scope were broader considerations like the impact on First Nations rights and title, the project’s environmental impacts and the value of lost agricultural land. Put all of those together and it’s hard to imagine the BC government going ahead with the project. A full inquiry is needed to investigate how BC Hydro executives conspired with the previous BC government to manufacture the case for Site C.
Sadly, the BCUC estimates termination and remediation of the land would cost another $1.8 billion, in addition to about $2 billion already spent. That’s an outrageous amount of wasted money courtesy of a previous government that repeatedly patted itself on the back for being a good fiscal manager. The new BC government should let BC Hydro ratepayers off the hook and absorb this debt onto the provincial books as taxpayer-supported debt given how the project was a politically driven exercise from the start. A project of $9–10 billion should never have been removed from BCUC oversight. Alas, this is a good reminder of why independent review through bodies like the BCUC is so important.